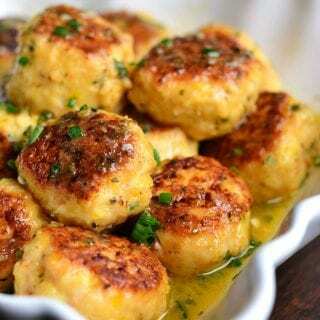 I’m sharing an delicious appetizer that today. It’s one of my favorite appetizers to serve at gatherings of just because. 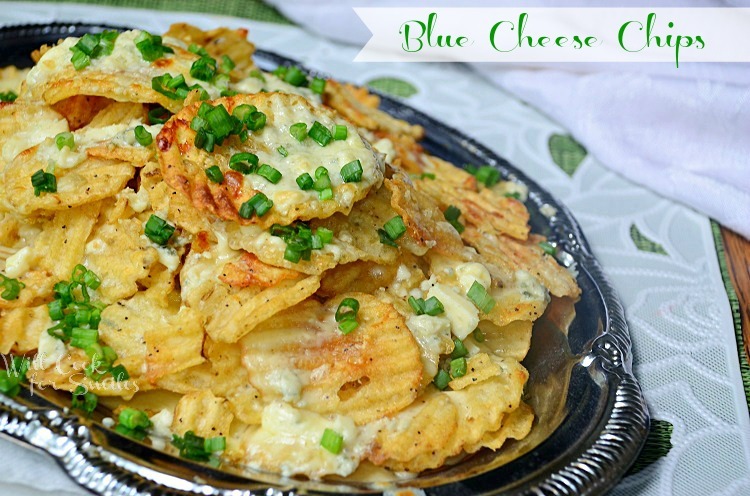 Blue cheese chips are made with easy cheese fondue, blue cheese crumbs and green onion. Careful, they tend to disappear very fast! 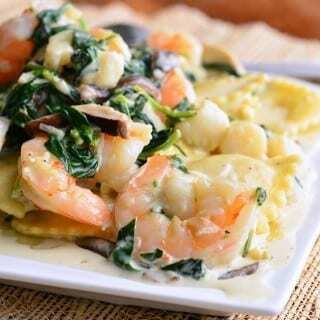 I’ve already shared some of my favorite copycat recipes from a restaurant I used to work in. 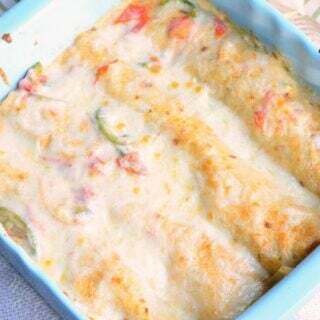 Today, I want to share an appetizer that everyone absolutely loved, employees and guests alike. 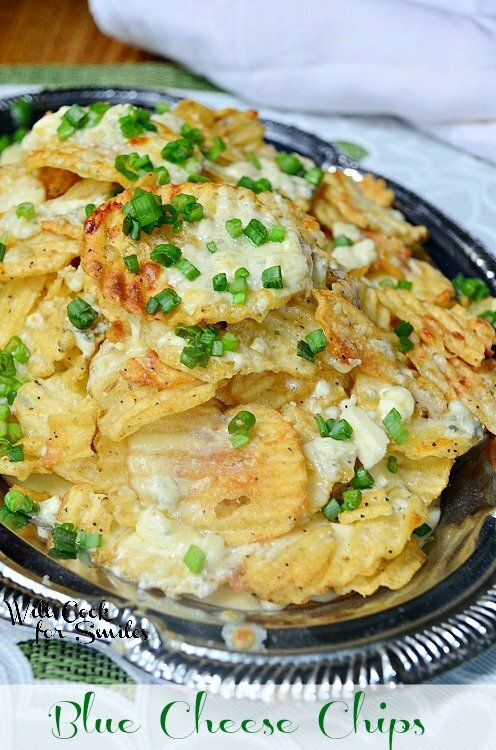 Blue Cheese Chips were among the most popular appetizers. I loved them but they were such a guilty pleasure. Bad part about working in the restaurant is knowing exactly how things are made and exactly what goes into the meal. That’s why I said that those chips were a guilty pleasure. One serving had enough calories to fill your daily requirement, the fondue came from a bag and the chips were fried. This Blue Cheese Chips appetizer, that I make, is inspired by the ones at the restaurant but in no way is it guilty. It only has four ingredients in the fondue and the chips are made with real, natural ingredients. 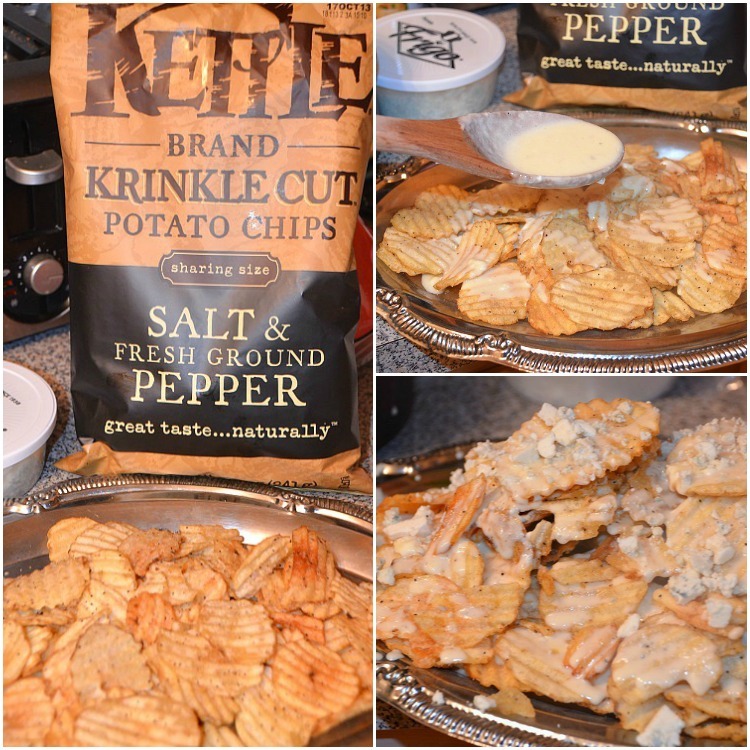 I use The Real Kettle Chips which are all-natural, hand-cooked potato chips and made from unpeeled potatoes in small batches for a superior taste. 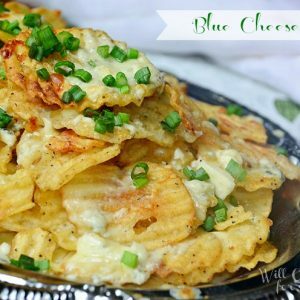 You will definitely feel good about serving these Blue Cheese Chips to the family and friends, as well as, eating them yourself. 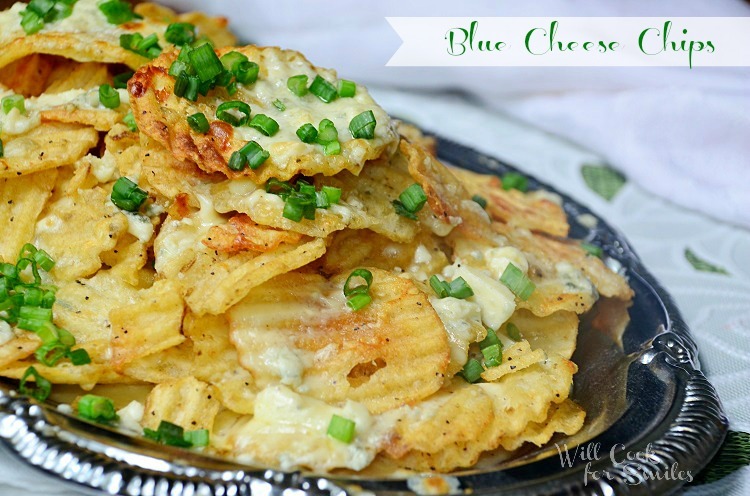 Blue cheese chips are made with easy cheese fondue, blue cheese crumbs and green onion. To make fondue: Combine stock and heavy cream in a small sauce pot and set the heat to medium. Grate the cheese into the warm liquids. Add the blue cheese crumbs and stir. Bring the cheese mixture to low boil, stirring often. Take off heat. Spread half Kettle chips over an oven safe serving tray. Slowly pour part of the fondue evenly over the chips. Cover with the remaining chips and pour more fondue over the top. Sprinkle with the blue cheese chips. Preheat the broil and move the oven rack to the medium spot. Set the chips on the rack under the broil until the blue cheese crumbs are melted. *Be careful and keep your eye on it. * Check every 30 seconds. Once the cheese is melted, take them out. Sprinkle with green onions and serve. These chips look sooooooooooooooooo delicious! Knowing myself I’d probably could eat half of it by myself. ok, yum, officially yum. cant imagine anything better yum. thank you! 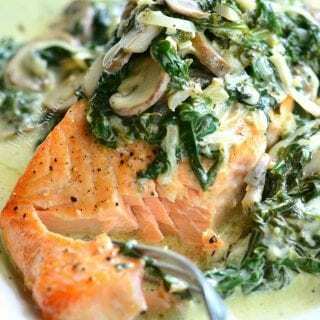 I don’t go on Pinterest often, but for some reason headed there today and saw this recipe. I want to try serving this to my guests at one of our Tapas Nights, and in fact may just go ahead and do it this weekend. It sounds so good. And different. Thanks. Wow, I am loving all of your recipes today. These would be great for Memorial Day or 4th of July parties! Thanks again! 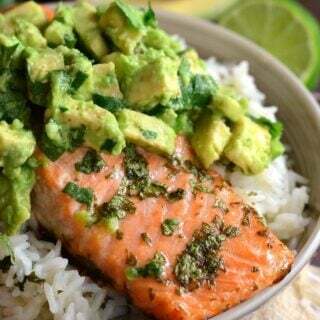 Oh man- I am definitely craving this!! Looks amazing!! Yummy. I wish I had some potato chips in the house. I LOVE bluecheese chips! Never thought about using bagged chips for them! I featured you this week on Blissful & Domestic. Stop by and check it out! Your recipe calls for “stock”. We need a better description. What kind of stock??? I want to make this but will wait for an answer, thanks! I prefer to use vegetable stock. I will put that in the recipe as well. Thank you! I made these today to see if they would be good for our party next week. YUM! Loved them! My10 year old loved them too. yeah! Thanks so much! They will be on the menu. Well this is the best compliment to me! I’m so glad you liked it! Have a fun party!! Lyuba, these are such a great idea! 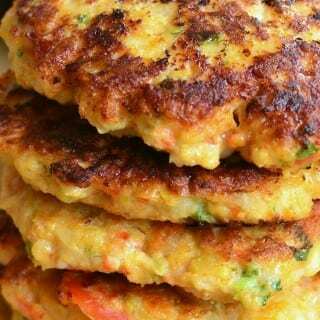 Love all the ingredients and can see this being great party food, especially during the game. They are so delicious and fly away in a flash! Thank you so much, Brandie!